Belly bands for dogs can provide a solution for male dogs that just can't stop soiling inside the house. While they aren't foolproof, they can assist with training your dog when you need some extra help. Does your male dog lift his leg in the house? Is your home taking on the unpleasant smell of urine? If you're having problems with your pet soiling your home, you're certainly not alone. Repeated house accidents are one of the main reasons many pets wind up in shelters year after year. Frustrated caretakers find themselves in the position of having to choose between their family's health and their love for their dog. While proper training is the most effective way to avoid such a situation, some dogs are undoubtedly more difficult to train than others. There is a product on the market that is designed to help dog enthusiasts deal with indoor urination problems. It's called the belly band. 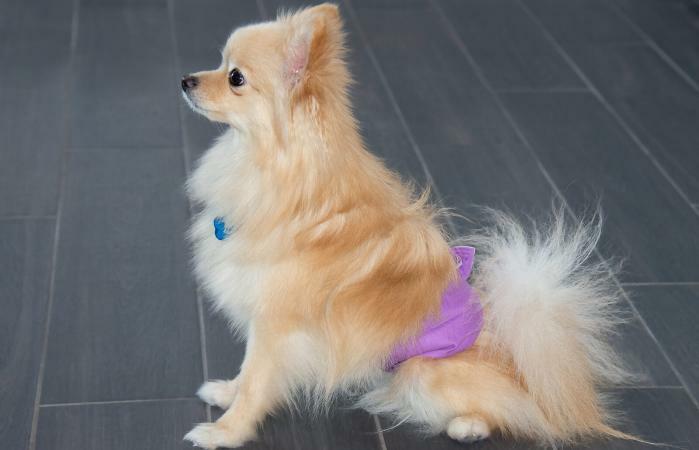 Belly bands for dogs are essentially doggie diapers designed especially for males. The garments consist of an outer shell or "band" that wraps around the dog's midsection, effectively enclosing his privates. The outer shell contains an absorbent inner liner to catch urine. You can purchase special liners, but sanitary napkins and even baby diapers are also sometimes used and can easily be changed and disposed of. Some models come with an adjustable strap that wraps around the dog's chest and neck area for added security, but most models only wrap around the belly. 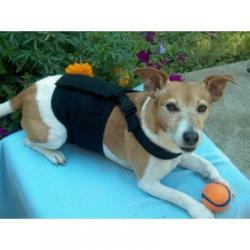 The garment is lined and secured around the dog's waist with a Velcro closure. When the animal attempts to lift his leg and urinate, the band prevents the urine from escaping, and it is drawn into the liner. At clean up time, the liner is thrown away and replaced with a fresh one. If the outer shell is damp, it will be necessary to rinse it and allow it to dry before further use. For this reason, it's best to have at least two bands on hand so you'll always have a clean, dry band available when one becomes soiled. If you're having difficulty training a male dog or pup from lifting his leg in the house, a belly band can be a useful training aid. Always take your pet outside to exercise as part of a regular potty training program and be sure to praise him well when he has a success. Return indoors and put the garment on him. Plan to take him outside again at regular intervals, but if he soils in the house in between trips, the band will absorb the urine. This should lead to a feeling of dampness that most pets find unpleasant. The theory is that if it happens often enough, the dog will refrain from urinating while wearing his band. When you find your dog going outside consistently and his band remains dry in between trips, you can begin allowing him to go without the band indoors for short, supervised periods to see if he has learned not to soil in the house. If all goes well, you can eventually quit using the belly band altogether. Even a well-trained dog may occasionally find it impossible to resist marking his scent when visiting other people's homes or staying in hotel rooms. In cases like this, pack a belly band along with you, and put it on your pet if needed. Not all house soiling problems are related to training/behavior issues. In fact, some medical conditions can also lead to incontinence. Even advanced age can play a role in involuntary soiling as the muscles that control the bladder begin to weaken. In cases such as these, a belly band can be an ideal solution to keeping your living space, as well as your pet, comfy and dry. Wearing the band overnight eliminates the problem of your dog soaking his bedding and other furniture while asleep. Although belly bands were created primarily as a housebreaking aid, they can prove useful for keeping an amorous male dog from breeding a female companion in heat. The band securely covers the dog's private area making any efforts at breeding ineffective. However, the band is not fool-proof. If the dog is very determined, he may chew through the band to escape it. Therefore, you can use the band as extra insurance to prevent dogs from mating, but it wouldn't be wise to leave the dogs alone together unsupervised. Dog owners considering using a belly band may be concerned that this product can actually make a difference. If you research dog belly band reviews online, it's clear that the product has many satisfied users who found they improved their quality of life with their dog. The Belly Bands company was a Staff Pick from Modern Dog Magazine in 2017 and bands are recommended for use by the magazine for certain house training issues. Average reviews of belly bands on pet supply sites like Chewy, Amazon, ranging from 4 to 4.5 out of 5 stars. Professional pet sitter Morgan Weber from Lucky Pup Adventures reports that clients who use the bands have found them to be, "a great tool to try when your dog has incontinence, overexcitement, or potty training challenges." A quick Internet search reveals numerous sources for this product, including the sites listed below. Belly Bands is the "original" manufacturer of belly bands. They sell bands designed for both male and female dogs. Pricing for the male bands start around $9 and up and $18 and up for the female versions. Pet Shoppe Boutique carries several types of belly bands in cotton and flannel which are machine washable and are about $10 each. Pet Expertise sells their own Belly Band for Dogs for about $17 each. The wraps are designed exclusively by their trainer and are easy to clean and care for. Chewy.com carries several belly bands. A popular choice is the Pet Parents Belly Band Wrap which retails for about $17 and get 4.5 out of 5 stars from users. Amazon.com has the PUPTECK Reusable Dog Belly Band for $11 for a three-pack. 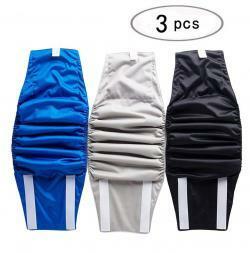 They are machine washable, come in black, grey and blue and are available in XS and X sizes. Walmart carries several brands with the Pet Magasin Washable Belly Wrap getting 4.7 out of 5 stars from users. They come in pretty colors and a pack of three and retail for $10 to $14. Petco sells the So Phresh Washable Wrap for about $20 to $24 for a pack of two. They come in small, medium and large. Another option is the Top Paw Disposable Male Wrap sold by PetSmart. They come in packs of 12 in sizes XS, S, M, L and XL. These could be a good choice if you have a temporary problem and don't need to save money by rewashing your bands often. Target sells an economical choice with the PoochPad Reusable Male Wrap. They retail for $13 to $26 and come in sizes S, M, L and XL. The most important part of using belly bands for dogs is choosing the correct size for your pet to prevent the possibility of leaking. Most bands have an elastic gathering under the belly for a more tailored fit, but it is necessary to measure your dog's waist to determine the right size to order. When you take that measurement, include your dog's plumbing beneath the tape measure so the band won't be too tight and cause chaffing. If you find your dog is right on the borderline between sizes, it may be better to go with the next size up, but you might want to contact the website for advice. Belly bands are specifically designed for male dogs, and they won't prevent a female from urinating in the home. However, most merchants who sell bands also carry britches for females that serve the same purpose and also double as a solution for females in heat. Just remember that you should always remove these garments before taking your dog outside to exercise.